In 2009, we burned two different patches of the same native sand prairie in the same year – one in the early spring and one in late July. Cattle were on the site during the whole season and shifted their focus to each new burn patch as it greened up after its burn. During the following year, it was interesting to see which plant species showed up most strongly in each of the two burn patches as the grazing shifted to yet another patch. Deer vetch (an annual legume – Lotus unifoliolatus) was one that was particularly abundant in the summer burn patch in 2010 – though it also had a pretty good year elsewhere as well. Anyway, I figured we’d seen the end of the big showy plant responses to that summer fire by the end of 2010, but now I think I was wrong. 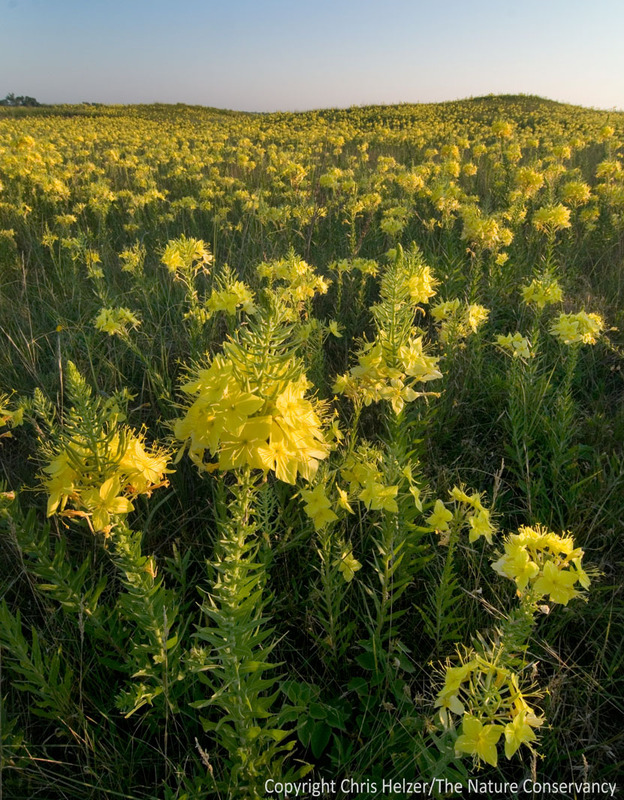 Showy Evening Primrose (aka Four-Point Primrose or Oenothera rhombipetala) in sand prairie - Platte River Prairies, Nebraska. This week, that old summer burn area is just loaded with showy evening primrose (Oenothera rhombipetala), a biennial native wildflower that forms a rosette during its first season and blooms during its second. I can’t be completely sure that it’s abundant because of the summer fire and grazing, but when I stood on a hill overlooking the area, the edges of the primrose explosion tracked right along the edges of the summer fire unit. I’ve been trying to find out more about when this primrose germinates (fall or spring) to see if that makes sense with what I’m seeing, but haven’t found anything specific enough. If it germinates in the spring, that would make sense, since the surrounding vegetation would have been weak in the spring of 2010 (because of the 2009 summer fire and subsequent grazing) and would have favored germination of plants like the primrose.